I have been sitting on this project for months now and have finally gotten around to taking pictures. MY OFFICE. This has seriously been a labor of love as I’ve always wanted my own creative space. I had one when we moved into our house almost 5 years ago but it was just the built-in unit in our basement. And not to sound ungrateful or anything but it was the ugliest, yellow-y, varnished wood built-in unit. Sorry, original house builders of 1984! After a long process of redoing our basement, I got my dream space that is the girliest corner of my all boy house. Here’s how I ended up getting my special space. I’m so thrilled to finally be sharing another finished space in my house! I feel like all I ever do is plan and Pinterest board my ideas to death and they never actually come to be. But I’m changing that with project sheets (I’ll share about that soon!) and it’s working! This particular level of our house used to be completely different and fairly haphazard but with a complete (unexpected) basement renovation, it was the perfect opportunity to change some things around. Y’all…these past couple of weeks have been nothing but straight up adulting! There has been a surgery, schedule conflicts and reorganizing, one kid with an eye problem, both kids on a breathing treatment, party plan/prep, etc. I’ve had to let some things go here and there for the time being and, unfortunately, one of those things was this wonderful little space of mine. I hate that, but it happens. Slowly but surely, we’re getting back in a groove, finding new ways to tackle different issues and so on and so forth. So today I want to share with you one of my happy spots in our house, the mantle in our living room. This little space has undergone a few makeovers over the two and a half years that we’ve lived here but this is, by far, my favorite one. I don’t really see this changing anytime soon. It’s bright, soft, and cheerful with family heirlooms, keepsakes, and good vibes. Enjoy! The window is one of three that hubby picked up at a garage sale for me at a steal of a price. All three for $15! The cameras were pasted down to me by my mom and belong to my great grandfather. One of them, not sure if it’s one of these or one that sits on our piano (you’ll see that one of these days when I finish that area! ), was actually made by him. This little book is very special to my husband and me. It held our rings on our wedding day. Some of the details on it are from my grandmother’s jewelry box. I’m super excited to share a new project I’ve come up with called, you guessed it, “Little Happy Corners”! It’s my version of a home tour. We’ve been in our house now for 2+ years and I’m finally getting around to making the each space less hodge podge and more cohesive. I get so excited when I finally finish a space but I never share it because the whole room isn’t completed. To remedy this, I’ll be sharing my home with you in pieces! 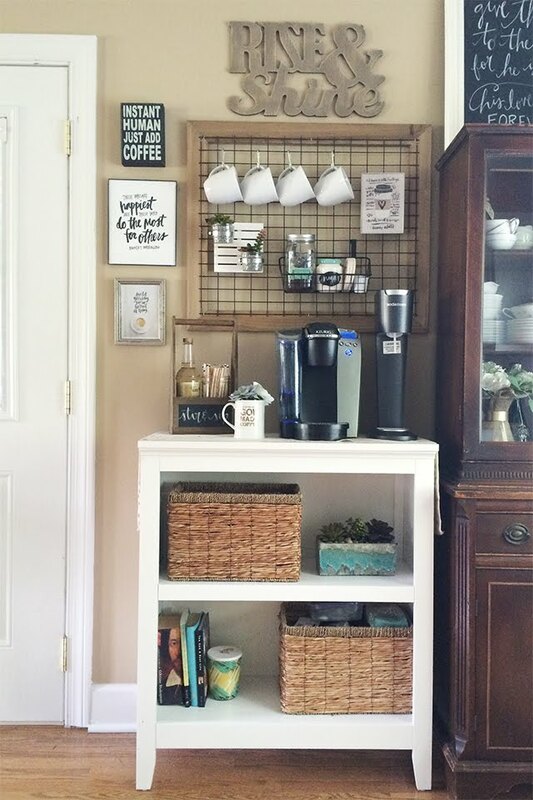 The first space up is my coffee bar. This little space has been a work in progress since Christmas 2013. That’s when my hubby built the grid that hangs above the small white book shelf. It finally came together last week, even though I’ve shared it a few times on my Instagram here and there. The final piece that brought it all together was the fabulous “Rise & Shine” wooden sign that hangs at the top! Have a space that you love, a space that you’ve been working on, or just a space that you’ve created that makes you uber happy? Share it and use the hashtag #littlehappycorners!